Dear Fellow Devotees of Our Lady of the Rosary,In this February 2011 issue of our News Flash I have news to share with you about the Venerable Pauline Jaricot, who, as you know, founded both the Propagation of the Faith and the Living Rosary.Many of you have heard the lovely audio presentations by David Eaves on our website. David is from Wales. 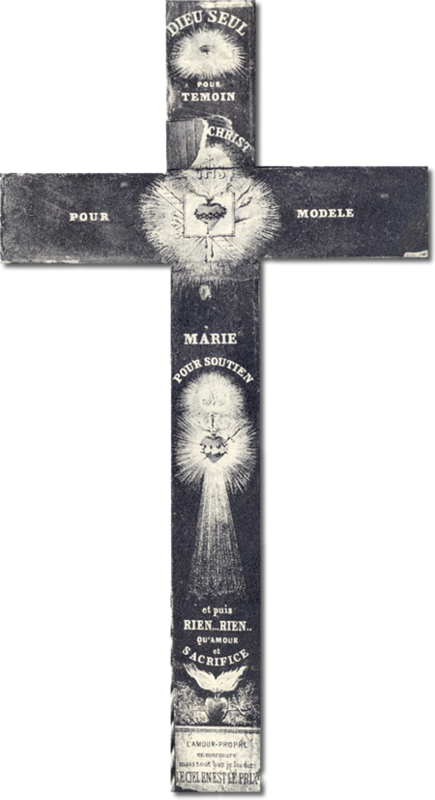 If you have not, I invite you to listen to his presentation about the Venerable Pauline Jaricot, Saint Philomena, the Rosary and the Brown Scapular. You will find David’s Audio presentations at the bottom of the pages on the sections, Foundress (Pauline Jaricot), Patroness (Saint Philomena), the Rosary and the Brown Scapular. David Eaves has also spent the last two years producing beautiful recordings of the Holy Rosary for every day of the year. Each recording is filled with interesting information on the Saint of the day and the nicest spiritual meditations. Sadly, David has been stricken with the most devastating form of brain cancer known. In this News Flash you will find the story of David’s pilgrimage with Father Copsey and the Representatives of our England Center to Ars and Lorette, Pauline Jaricot’s home in Lyon, France. I have included a lovely prayer David put together which can be used for private use, but I wanted to share it with you because of its deep beauty. I know you will love it as much as I do. We unite with David in praying for his cure which would be the miracle our holy foundress needs for her beatification. Still, always, we pray that the Will of God be done and that David be given the grace and courage to carry this huge cross with patience, love and trust. We reach out to his family with our prayers and a warm embrace. I am also going to share with you news about a new organization formed at the home of Pauline Jaricot, Lorette, in Lyon France. I have included a letter from them as wall as the meeting minutes from their meeting in December, 2010. 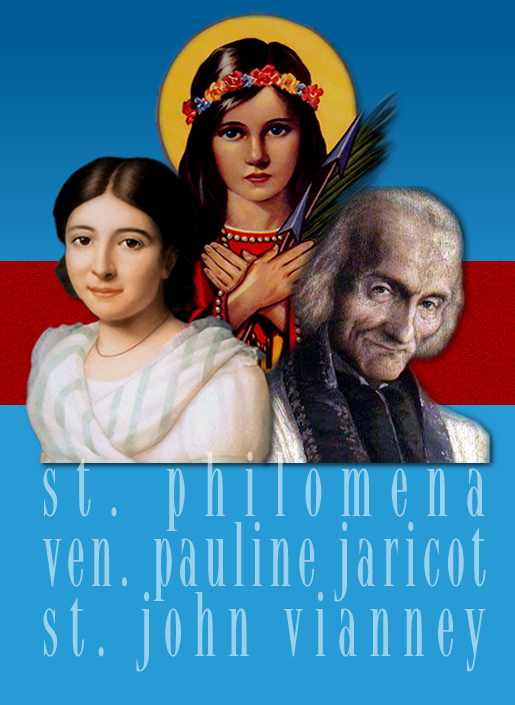 As I close, I wish to remind you of the deep connections between the Venerable Pauline Jaricot and her friendship with St. John Vianney and their relationship with Saint Philomena. We traveled from London to Lille, and on to Lyon by train. The tomb of Pauline is at St. Nizier, a very large old church, imposing and cold. We offered the Rosary at her tomb and then, after climbing hundreds of steps through old Lyon, we reached the Basilica of Fourviere where Pauline made her personal vow of virginity to the Most Sacred Heart. There, we had a stunning view over all of Lyon. We descended a short distance below to Lorette (the house of Pauline Please click here to learn much more about Lorette) where Sr. Catherine met us. The four Franciscan Sisters at Lorette were very kind to us. Together with members of the local church, they had been making a novena of prayers for David. We were invited to take part in the final day of this Novena in Pauline’s room. Sister Pricilla showed us around the newly refurbished house of Lorette, which is being made into a museum. Each room is representative of Pauline’s different activities. There is a room with Pauline’s mission work, and another room with relics, as she loved relics. I was very struck by the similarity to the way Pauline worked and the way you work, Patti! I would truly say you are a perfect continuation of her work! The refurbishment of her grounds and the renewed interest in Pauline’s cause is being sponsored by the Archbishop of Lyon. Lastly, we were taken to the room where Pauline died. This is a lovely room, full of atmosphere and with an amazing view over Lyon. When Pauline was dying she asked to be moved over to the window so she could look out over her beloved Lyon. I felt such peace and joy in that room. It was for me the highlight of our visit. We prayed the Rosary with the local people and the Sisters. We then attended the Mass at the chapel of St. Philomena at Lorette. 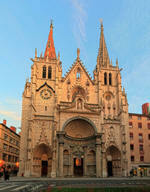 I was told that the relic of St. Philomena in the chapel disappeared several years ago and there is none in Lyon. Pauline loved relics and there were so many, but not one of St. Philomena! On 9th January, the anniversary of the death of Ven. 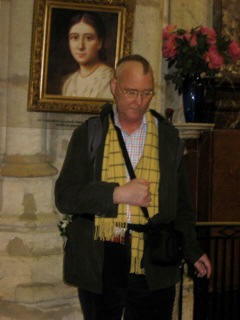 Pauline Jaricot, we took a taxi to St. Nizier, where the Mass was celebrated by the Auxiliary Archbishop, Msgr. Thierry Brac de La Perrière. Msgr. Brac joined us in the Rosary before Mass, as did many parishioners. The Church was full! Pauline’s Heart is located a short distance from St. Nizier at the Church of St. Polycarp which is closed during the week and opened only for Sunday Masses. A Third Order Dominican lady, Emmanuela, helped us to get in at the side door and view the place where rests the Heart of Pauline. 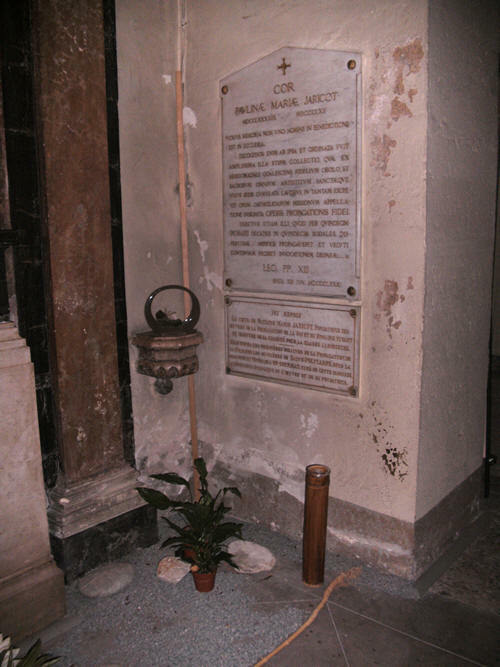 Her Heart is interred in cement in the wall of a side altar to St. Francis Xavier. There was literature about Pauline here in French. It was a difficult trip for David and I very much admire his faith, good spirits and courage. On Monday, January 10, 2011, the day we celebrate St. Philomena’s birthday, we traveled to Ars . At the entrance to the small village is a large statue of St. Philomena pointing the way to the Basilica dedicated to her. Inside the basilica is a beautiful side chapel reserved to honor St. Philomena. What struck me most about the house of the Curé of Ars is its austerity and simplicity. 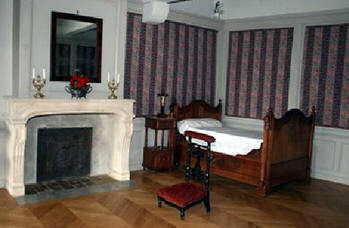 When viewing his little room we could even smell charred wood where the devil had set fire to his bed. On the little altar by his bed was a relic of St. Philomena. At the other end of town was the wonderful statue of the Curé with the little boy who showed him the way to Ars. We were very lucky that few people were there, because in the Summer I would imagine the place to be absolutely packed with pilgrims. O Sacred and adorable Heart of Jesus! Furnace of Eternal Love! Ocean of Infinite Mercy! Consolation of the Afflicted! Refuge of Sinners! Hope of the World! I place my trust in Thee! Fervently, I adore Thee and unite my heart, my affections and my supplications to Thy most admirable Heart. To me, Thou hast given Thyself with an ardor and vehemence of the deep truth of Thy Infinite Love and nothing gives Thee more honor than that I place my whole trust in Thy Love. For this end, Thou wast pierced with a lance on the Cross and, for this purpose, Thou dost remain a daily Victim of Thine own Love on the Altar. O infinitely compassionate Heart of Jesus, I humbly beg in Thy adorable Name and through the intercession of the Immaculate Heart of Mary, for a perfect healing of my physical infirmity and the courage to accept from Thy Sacred Hands what is best for my immortal soul. I ask this favor in honor of thy faithful daughter, Ven. 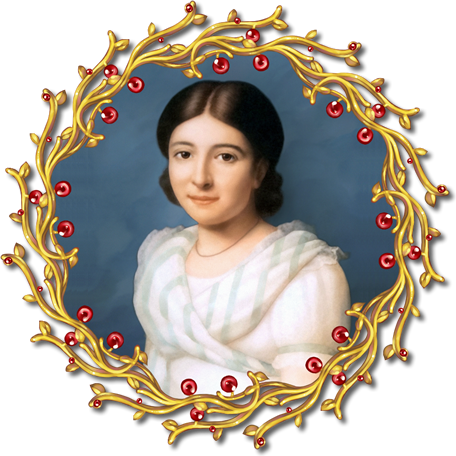 Pauline-Marie Jaricot, that through the Sacred Heart of Jesus, her victim heart and life of heroic virtue may be recognized by the whole Church. Saint Philomena, Ven. Pauline Jaricot and Saint Jean Vianney who while on earth were particularly devoted to the Sacred Heart of Jesus, join your voice to mine as I implore the blessings of health of body and soul through thy intercession. I beg thee, likewise, from the adorable Heart of Jesus, which has dominion over all hearts, to have compassion on all those who are in the dread state of mortal sin, and to open to them all the treasures of Thy mercy at the hour of their death. Most Sacred Heart of Jesus, I place my trust in Thee, in Time and for all Eternity. Amen. Persons receiving favors through the intercession of Venerable Pauline-Marie Jaricot, are asked to write or e-mail our Center. These will be submitted to Lyon, France in support of our dear Mother Pauline’s cause for sainthood. 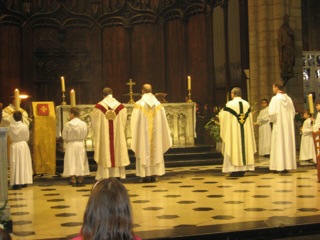 I am the Secretary of this association and the President is the Archbishop of Lyon, represented by Msgr. Thierry Brac de la Perriere. Nicole is a member of our office, of course. 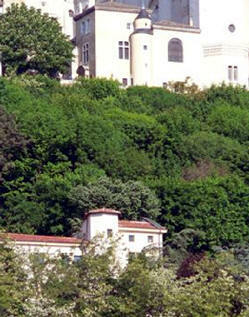 Our meetings are held in “Maison de Lorette” in Lyon, the very house where Pauline lived. We are all very impressed by your work and your energy and would like to strengthen our links with you. You will find here attached a translation of our objectives, an outline of the minutes of our last meeting (I did what I could to put it into English), and a list of our present members. As I speak English (I lived five years in Atlanta Georgia), I will be glad to have your comments and correspond with you and the Universal Living Rosary Association, in the name of the “Les Amis de Pauline Jaricot” Association. Promote the publication and the translation of her works. The following members of the Association met on December 15, 2010 at 5 p.m., at Maison de Lorette, head office of the Association: Msgr. Thierry Brac de la Perrière (President), Msgr. Jean-Marie Jouham, Sœur Cécile Guérin-Boutaud, the Misses Katy Campagnolo, Marie-Dominique Escaron, Elisabeth d’Escayrac, Marie-France Eymard (Vice Secretary), Nicole Eymard (Vice Secretary), Brigitte Liogier de Sereys (Vice President), Valerie Peyraverney, Nicole Saby, Colette Tempere et Catarina Zuccaro (in charge of Communication), Messieurs Gaetan Boucharlat de Chazotte et Bertrand Deau (Secretary). Increase the number of members – An announcement will be made by Brigitte Liogier de Sereys at the end of the mass celebrated by Thierry Brac de la Perriere at Saint Nizier church on January 9. Subscription forms will be distributed to the assembly. Recording the existing teams of the Living Rosary – Nicole Saby works on it with the Dominicans. Actions towards the poverty stricken people – Marie-Dominique Escaron makes several suggestions, such as micro-credit and assistance to small businesses. Recording of all existing documents – Nicole Eymard will continue her work with Mrs. Genin together with Pontifical Office for the Missions and Dominicans. Bertrand Deau will collect copies of letters of Pauline from archives of Missions Etrangeres de Paris, Jesuits in Vanves and Ursulines in Chavagnes en Paillers. Conferences on Pauline in 2012 – Prepare the content of a conference which will be given in several places by different people (such as priests or historians) during 2012, as that year has been consecrated to Pauline by Cardinal Barbarin. Simple booklet on Pauline – Monseigneur Jean-Marie Jouham, Colette Tempere and Katy Campagnolo progress well on the subject with the editor «Bayard Presse ». Monthly prayer reunion – Valerie Peyraverney and Catarina Zuccaro are congratulated for their organization of the prayer meeting every first Wednesday of the month. Valerie proposes the creation of a perpetual Rosary to be recited day and night around the world with two intentions: the sanctification of our priests, and the spreading of the gospel among the people of the earth. National Council of the teams of the Rosary with the participation of the international coordinator – The meetings are to take place in Lyon on March 25, 26 and 27 2011; the preparation is well under way by Nicole Saby, who is representing us. Social undertakings of Pauline – Work in progress by Bertrand Deau with the mayor of Rustrel, Roger Fenouil, the historical Association « Archipal » in Luberon, and Professor Daniel Murat (Avignon University) on the industrial undertakings of Pauline in Rustrel. This entry was posted on Thursday, February 17th, 2011 at 4:08 am and is filed under NewsFlash. You can follow any responses to this entry through the RSS 2.0 feed. Both comments and pings are currently closed.